This is taken from a 2006 Canine Health Concern newsletter. A few weeks ago, we felt compelled to send a letter to every homoeopathic or holistic vet in the UK. This is because we perceive that there is a problem which needs addressing. We received two replies, which means we got 108 silences. This is par for the course – whoever we write to, we are lucky if we get a reply. In the last few newsletters, I’ve been telling you about the successes and the positive changes that have taken place in the wacky world that is CHC. What I’ve always had difficulty in describing, is how hard those successes have been to achieve. Indifference and apathy have been the hardest things of all to cope with. You just can’t go anywhere with silence or dismissal. Back in 1993, I learnt about the dangers of vaccines from a homoeopathic vet. It was this man who finally answered my question ‘why?’ – why had Oliver died. Then I met some other homoeopathic vets who added weight to the belief that vaccines cause a wide range of diseases in humans and animals. We told them of our plans to research the issues surrounding ill health in the canine world, and they metaphorically held my coat and slapped me heartily on the back as they waved me off onto the front line to ‘fight the good fight’. I was invited, in the early days of CHC, to speak at the homoeopathic vets’ annual symposium and went expecting all of the homoeopathic vets to be like the ones I had already met. I expected, unconsciously, that I’d be amongst friends who understood what the CHC campaign was all about. Instead, I had a very difficult and somewhat unsettling experience. So there I was, on the platform, talking about the aims of Canine Health Concern, to what I thought was a group of like-minded people. Much to my own surprise, I started crying. I was standing on the platform in front of a fairly large audience, crying. But I didn’t know why. I had to turn around, collect myself, and keep on going. Later that evening, we all met in the bar. I was still pretty shaken by my own emotions earlier. And then something happened to explain to me what had been going on. One after the other, the homoeopathic vets came to me to tell me that they vaccinated. They were deeply honest with me, and I honour them for that. The reasons were pretty similar. They explained that if a vaccine went wrong, they would have the support of the Royal Veterinary College if they needed to defend themselves against angry clients, whereas if a nosode went wrong, they would be on their own. They explained that they had wives/husbands and children to support, and that vaccines provided essential income. One vet told me that he first came into homoeopathy because he himself had suffered a number of vaccine-induced diseases as a child, and that a homoeopath had helped to cure him. He told me that he cried every time he vaccinated an animal. I asked him why, then, did he do it? He told me that he had been given several thousand pounds by a vaccine manufacturer to set up his practice, and that he was tied into them for a number of years. Later that night, as I put my head on the pillow, Samson – who had died of vaccine-induced disease three months earlier – came to me, and beamed his love into me. He wrapped his energy around me, and comforted me. I don’t care if anyone wants to call me mad for telling you this. It was a very real, tangible, experience, and one of several which have convinced me that the spirit lives on after death, and that the animals are far more than we humans comprehend. I understood then why I had been crying in front of that audience: I had stood there totally open, without any defences in place, and I had picked up the energy of dislike that was being directed at me. I was airing an issue that made them feel uncomfortable. Samson came to tell me that I wasn’t alone. Since that time, and more especially in the last couple of years, I keep getting told that such and such a homoeopathic vet thinks I am (or CHC is) too contentious. I also keep getting told by disillusioned clients, that their homoeopathic vet is recommending vaccination, and sometimes they’re recommending titer tests to see if boosters are needed. I have a problem with this on several levels. My first problem is that I believe very deeply that no-one has a right to dictate to another human being how they should think, feel or behave. On this basis, I have to respect the rights of these vets to do what their conscience tells them they must do. My second problem is that I firmly believe that, if they understood what they were doing, then they wouldn’t do it. I could be wrong in this belief, but it is nevertheless a belief I hold after years of study. My third problem is that, having made their minds up about me and CHC, they don’t want to listen to the science we have to share. 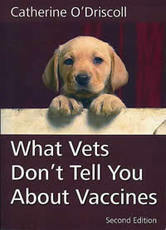 All 110 vets we wrote to were invited to read Shock to the System which contains the latest science on vaccine damage. Only one sent in an order. My fourth problem is that vets, of whatever persuasion, are so used to being worshipped and adored by their clients, and so brainwashed by the educational system into thinking that they are right and pet owners know squat, that they are not open to listening anyway. My fifth problem is that homoeopaths – supposedly – are taught about the vaccine miasm, and so they should already know that vaccines cause a vast myriad of diseases, and that vaccine damage is passed down the line. The problems with vaccines don’t stop with the dog they vaccinate; they can cause misery and suffering in generations to come. I also pointed out that vaccinated animals can also die of the diseases they are vaccinated against, and that whilst not enough is known about the nosode to say it guarantees protection, plenty is known about vaccines to demonstrate that they cause immense harm – through generations. And, furthermore (I said more politely than I’m saying now), if not enough is known about nosodes, then isn’t it time the homoeopathic veterinary fraternity did something to find out about them? Certainly, the homoeopathic vets I first came in contact with don’t vaccinate, haven’t done for many years, and have (as far as they’ve told me) no reason to doubt the efficacy of nosodes. So get your collective act together! Everything is made more complicated by the classical homoeopathic fraternity who say that nosodes shouldn’t be used as a preventative, because they can cause harm. On the other hand, one well-known homoeopathic vets says it is ‘irresponsible’ to leave your dog with neither vaccines nor nosodes. So how is the ordinary pet owner expected to make sense of all this? Actually, it’s not easy for me to say all of this in public, in the newsletter. I don’t want to attract even more dislike from the homoeopathic veterinary fraternity, and I don’t want to cause offence. But perhaps, by addressing the issue, people might think, and communicate, and the animals might be better served. It is not my place to dictate what other people do, think or say – but neither is it anyone else’s place to censor me (or you)! I think it’s important to talk about this since the animals have no choice. The homoeopathic vet who wrote and I were both able to agree that correct husbandry (i.e., appropriate food and care) raises the energetic and physical bodies so that they can better withstand disease. But if the research I have seen on vaccines is anything to go by, you simply cannot serve the energetic and physical bodies by vaccinating, because vaccines cause imbalances in these areas. They totally destroy the intelligence of the immune system. Of course, there is another side to the story. Whilst I am questioning the homoeopathic veterinary fraternity, I also know that they are good people who deeply care about the animals, and who do what they think is best. It’s not personal. It’s about the animals. I understand that it would be hard for a vet to advise their clients not to vaccinate; there are all sorts of issues involved. And yet a small number of homoeopathic vets are doing just this. They seem prepared to take the consequences, whether they be good or bad, because they believe that the adverse effects of vaccines are worse than dealing with viral disease. They suffer financially by refusing to take vaccine income. They also know that if they don’t vaccinate animals, there are plenty of vets lining up to do it, giving their clients the freedom to choose. What they won’t do is perform a medical procedure themselves that might cause harm. I do try to see the other fellow’s point of view. But if vets are performing potentially harmful and often unnecessary medical procedures on the animals, then vets – who are in a position of respect and authority – must demonstrate a balanced view, and an educated view. The thing is, we are not just having an intellectual argument. We aren’t just disagreeing on theories. We are talking about lives. We need to discuss these issues. It’s important – because the dogs matter, and the people who have to watch them die matter. Silence and ignorance (ignorance is the act of ignoring) are not good enough. Someone once said that the greatest sin against your fellow human beings is not to hate them, but to be indifferent to them. In the Bible God is purported to have said something like, ‘you can be hot or cold, but if you are lukewarm, I will spew you out of my mouth’. Running CHC, caring deeply, and being met with silence, apathy and indifference, and political concessions, wherever I go, I agree with God! I would rather those 108 homoeopathic vets wrote back to me, even if they said harsh things, than to simply be met with silence. Silence breeds misunderstanding, mistrust, and misinformation. Of course, there is another factor to consider: perhaps they think I am meddling in something I have no right to meddle in? Perhaps they only respect their fellow vets, and not an organisation which represents clients? Who knows – you can only guess if people don’t talk to you.